Abstract: Introduction: Frailty is recognised as a significant variable in the health of older adults. Early identification by paramedics of those at risk of frailty may assist in timely entry to an appropriate clinical care pathway. Early referral to such pathways has been shown to improve patient outcomes and quality of life, as well as deliver economic benefits. To date, little research has been completed regarding assessment of frailty by paramedic professionals using validated assessment tools. The objective of this study was to determine paramedicine students’ perceptions of screening tools to facilitate assessment and knowledge of frailty of older adults. The Edmonton Frail Scale (EFS) and the Groningen Frailty Index (GFI) were determined suitable for this purpose.Methods: The research adopted a mixed methods approach using a survey tool developed to gather both qualitative and quantitative data from students at the completion of a structured aged care clinical placement. Thematic analysis of the qualitative data identified key features of the tools, while a Likert-type scale was used to measure perspectives about the suitability of the tools for use in paramedic practice.Results: Thirty-seven paramedicine students were invited to participate in the study. Thirteen were able to use both tools to conduct frailty assessments and submitted survey responses. Student perspectives indicated both the EFS and GFI are potentially suitable for paramedicine and as clinical learning tools regarding geriatric assessments. Median time to administer the tools was eight minutes for the EFS and ten minutes for the GFI.Conclusion: Paramedicine students support a frailty assessment tool to assist clinical decision making regarding older adults. 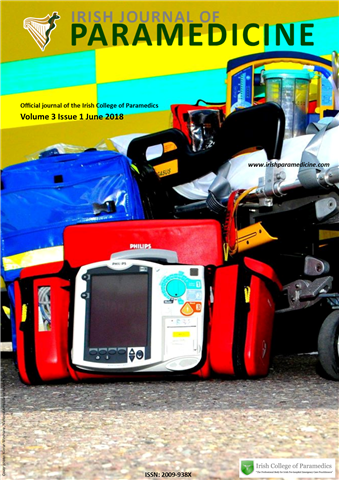 Further appraisal of validated frailty assessment tools by operational paramedics in a pre-hospital environment is warranted to determine absolute utility for Australian paramedics. Abstract: Introduction: Community paramedicine (CP) establishes an ongoing patient relationship beyond short emergency care episodes. How care planning and case management have been adapted from the isolated incidents of traditional practice is unclear. The objective of this study is to contribute to paramedic practice by examining broad areas of care planning in CP, identifying gaps in the evidence, clarifying key concepts, and reporting on the types of evidence that address and inform practice. A qualitative analysis of included literature outlines program capacities and identifies comprehensive models of care that can inform clinical practice in CP. Methods: A scoping study was completed that included conducting a systematic search of the literature (in MEDLINE and CINAHL) and selecting relevant studies, followed by data extraction, summarizing, and reporting. The authors of included studies were contacted to confirm the aspects of care planning that were extracted from their respective studies. Aspects of care planning were compared between studies and used to generate a comprehensive list of existing practices. Results: Ten of 1648 studies met inclusion criteria. Qualitative analysis identified 22 aspects of care planning along four themes; enrollment (n=3), assessment and management (n=6), intervention and care (n=5), and collaboration (n=8). No study included all 22 aspects of care planning. One aspect of care planning was present in all 10 studies; collaboration with primary care providers. Conclusion: The aspects of care planning identified through this study provide a framework that can guide service providers in the delivery of care and researchers in defined outcome measures to be assessed. Future program development should be guided by the finding that all articles included in this study included collaboration with primary care providers. By summarizing care planning within CP programs, ongoing program development can embrace collaboration with other care providers to help insure that patients receive the appropriate care. Abstract: Since the turn of the century, significant progressive changes have taken place in the provision of prehospital emergency care in Ireland. Few would have dared to imagine the scale of advancement both in terms of education and scope of practice that has taken place since the bells tolled to herald the arrival of the new millennium. Academically, paramedics in Ireland who for over 20 years have been qualified at diploma level now have the opportunity to qualify with an honours bachelor of science degree, and the possibility of progression to masters and doctoral degrees should they feel so inclined. From a clinical perspective, the Advanced Life Support service that is available nationwide today has evolved from an emergency service provided by EMTs just a few short years ago.In order to make the step up to the next level in our development as a bona fide recognised profession, it is essential that we embark on the journey of the development of our own body of knowledge in relation to our education, our practice and our profession as a whole. This editorial will explore some issues related to this. Abstract: Introduction: Paramedics’ work includes periods of physically light activity, but also involves short periods of relatively intense physical activity. Even during their studies paramedic students’ days involve a lot of sitting, i.e. physically sedentary behaviour. We initiated a programme to motivate paramedic students to be physically active during their studies. In this study we report physical fitness among paramedic students who for one year participated in brief physical activity counselling consisting of both verbal and a written individually tailored exercise programMethods: A total of 40 paramedic students (26 female, 14 male) had participated voluntarily in a physical activity programme alongside their studies. Subjects’ maximal oxygen consumption and muscle strength were measured at baseline and at one-year follow-up. According to the results of the baseline tests all students were given an individual exercise programme, which included aerobic and muscle strength training.Results: Sixty-five percent (26/40) of the students participated in the follow-up examinations. At baseline male students had higher mean maximal oxygen consumption (VO2Max) and, as expected, greater absolute muscle strength than their female counterparts (all p-values <0.05). During the follow-up females had improved their VO2Max on average by 2.4 ml/kg/min. Furthermore, females on average improved the number of squats by 4.2 [95% Confidence Interval (CI) 0.01 to 8.33] repetitions, and males improved the number of push-ups (mean improvement 4.8, 95% CI 1.93 to 7.57), and left arm grip strength (mean improvement 4.0 kg, 95% CI 1.39 to 6.53).Conclusions: It seems to be possible to maintain, and even slightly improve paramedic students’ physical fitness with a self-directed, guided, home exercise programme. This approach could enhance prospective paramedics’ willingness to develop the necessary physical qualities long-term throughout their clinical careers. Abstract: Packaging is an important part of transfer medicine. Appropriate packaging in a “layered” manner is widely accepted as a safer way to move patients who may have various cables or tubes attached.In our practise we use modified ventilator airway tubing, approximately 0.5 metres in length with a slit down the longitudinal axis to contain these cables and/or tubes. This tubing has become colloquially known as “Elephant tubing”This tubing is typically used to contain ECG wires and medication giving sets. The Oxygen saturation probe wires and one intravenous access is typically left out during the transfer process in order to be able to access same.